The link that brought you to this page and the page title are a bit of a misnomer, because this short report is not long enough to cover so many chapters of the Bible. What the link and the title do, however, is track where we are in our plan to read through the entire Bible in 1 year. May each report pique your interest and help you to draw near to God. The Bible, James 4:8, tells us if we do so God will draw near to us. Unless otherwise noted, Scripture is from the ESV. Works cited are at the end of the report and a side by side screenshot of the ESV and the NIV follow that. Internal links provide additional information. BIBLE READING—WEEK 15—2 SAM 16 – 1 KINGS 9: Last week’s Short Report looked at King David’s darkest moment involving Bathsheba and her husband, Uriah the Hittite, including the consequences of David’s sin, his confession, and the forgiveness he received. This Short Report looks at King Solomon, especially the circumstances surrounding the building of Solomon’s Temple. As a natural consequence of David’s sin—violence against Uriah and his house—the prophet Nathan told David, “The sword shall never depart from your house” (2Sam 12:10). The sword, of course, represents violence and we saw much of the internal violence among David’s children in the previous week’s readings. Solomon, however, was an exception to that. The Bible also tells us that God loved Solomon and sent the prophet Nathan to call him Jedidiah (2 Samuel 12:25), which means “loved of Yahweh” (ISBE, Olive Tree). These two names don’t conflict, but reinforce God’s commitment to David and all of God’s people—people that have a heart after God’s own heart—who are a people of peace and are loved by the LORD (Yahweh). By the time of David’s death peace was established and alliances were recognized with the surrounding nations, such as are seen in Solomon’s marriage to the Pharaoh’s daughter (1 Kings 3:1), and the trade deal Solomon made with King Hiram of Tyre for building supplies and labor to assist in the building of the Temple (5:1-12). In 1 Kings 6:1 we learn that the work started on the Temple 480 years after the Exodus and after Solomon had been Israel’s king for 4 years. According to the Zondervan NIV Bible Commentary, “The end of Solomon’s reign is 931/930 B.C. This puts the beginning of his forty year reign at 971/970 and the fourth year at 967/966 and the date of the Exodus at 1447/1446” (Barker, 502). We are told in 2 Chronicles 3:1 that Solomon built the Temple on “Mount Moriah, where the Lord had appeared to David his father, at the place that David had appointed, on the threshing floor of Ornan the Jebusite” (cf. 2 Samuel 21). This appears to be the same place where Abraham brought Isaac to be sacrificed in Genesis, which is called a mountain in “the land of Moriah” (22:2). It took seven years to build the Temple (1 King 6:38), which was larger than the Tent of the Meeting. However, since it was only 90 feet in length and 30 feet in width, the Temple was “built for the LORD” (v. 2, HCSB), and not designed to hold a congregation. According to 1 and 2 Kings - People's Bible Commentary, “Only the priests were allowed to enter it to perform certain prescribed duties” (Wolfgramm, 41). In front of the Temple stood two bronze pillars, one on either side of the entrance. The one on the south side was called Jachin, while the pillar on the north side was called Boaz (7:21). 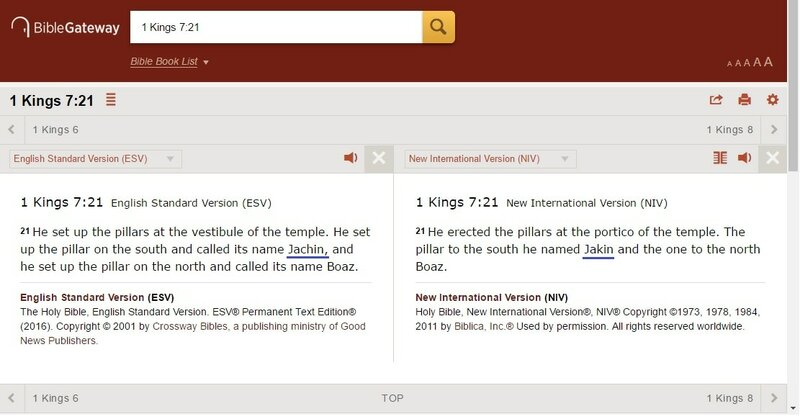 I need to point-out that different Bible version sometimes translate proper names with spelling variations, this is the case with Strong’s Number h3199—יָכִין or yâḵîyn—in 1 Kings 7:21 where the ESV spells this Jachin while the NIV uses Jakin (ESV Concordance, Olive Tree). The Zondervan NIV Bible Commentary explains the names of the pillars: Jakin means “he established” and Boaz means “by him he is mighty.” Thus, “the pillars were to be an ever-present reminder to each successive king of the fact that he was ruling by God’s appointment and by his grace, and that in God lay his strength” (Barker, 505). A closing thought, the Temple is also called “the house for my name” (v. 19). This brings to mind the Ten Commandments, because, like a name, the Commandments tell us who God is—He is Holy and He expects His people to live by His Word. Also, because the Second Commandment says, “You shall not take the name of the Lord your God in vain” (Exodus 20:7). Be it Solomon’s Temple in Jerusalem or a Christian church anywhere in the world, the message is the same—God is here—be holy. This Short Report centered on Solomon and on Solomon’s Temple, which is a main focus of the Bible verses (2 Samuel 16 – 1 Kings 9) for week 15 (April 9 through 15) in our plan to read the Bible in one year. In our reading we saw that, in contrast to his father, David, Solomon was a man of peace, who God designated from birth to lead Israel at a time of rest and to build the Temple of the Lord. Wolfgramm, Arno, J., 1 and 2 Kings - People's Bible Commentary. Concordia Publishing House, 1994. ​​​Zondervan NIV Bible Commentary: An Abridgment of the Gold Medallion-Winning Expositor's Bible Commentary, Volume 1: Old Testament. Barker, Kenneth, L., and John Kohlenberger III (Consulting Editors). Zondervan Publishing House, 1994.